Woohoo! The tour around our House of Love starts now! I can't wait to share about every nook and cranny of the new nest and I'm hoping that you are feeling a little of my excitement as we embark on this "A Happy Home" series on the blog too. Like what I mentioned previously, we are staying in a dual key unit which is the closest thing to having my own house since we have the in-laws to support. What is good about this arrangement is that while we are living under the same roof and in a single unit, it actually feels like we have our own space and privacy as we have our own 'homes' - a 3-bedroom unit for our family of five and a studio for the in-laws which comes complete with a toilet, kitchenette and even a balcony. To get the ball rolling, here's sharing about our foyer. 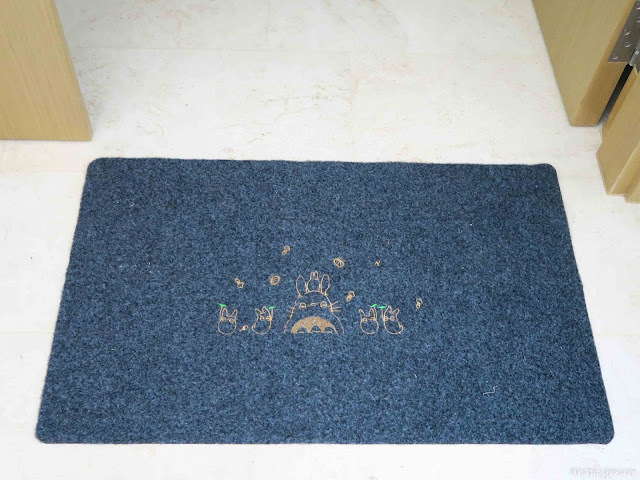 Woooh, but before that, here's how our main door mat looks like. I love the embroidery work of the kawaii chinchilla family and this mat which measures 80cm by 50cm cost me less than S$4 (exc. shipping fees) on Taobao! I am so new to Taobao but am glad we shopped for some stuff online and I'll share more about my loot with you in a separate post. 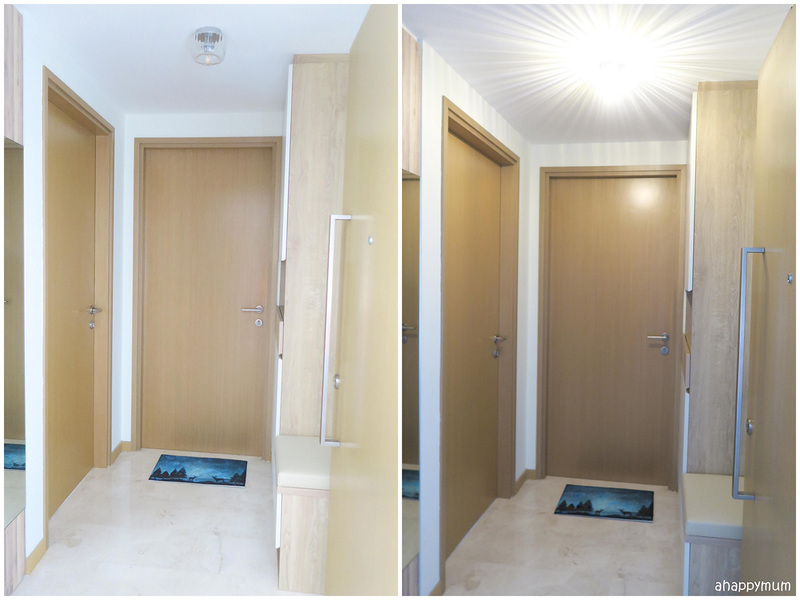 So, our main door opens up to a common foyer - which occupies around 5sqm - which leads to two separate doors as you can see below. The door on the left leads to my in-laws' unit while the one in front leads to ours. Oh yes, this might be a resale unit but the good thing was it came in great condition and the doors, flooring and built in kitchen cabinets and wardrobes were already intact. *phew* What's more, the light-coloured marble floor and the wooden laminated doors are a perfect match for our Scandinavian theme - which is simple, functional, minimal, has clean lines and uses earthy tones and wood as a main material. The foyer has my favourite light in the entire house, one which I call the Sun. I'm sure you can see why, right? 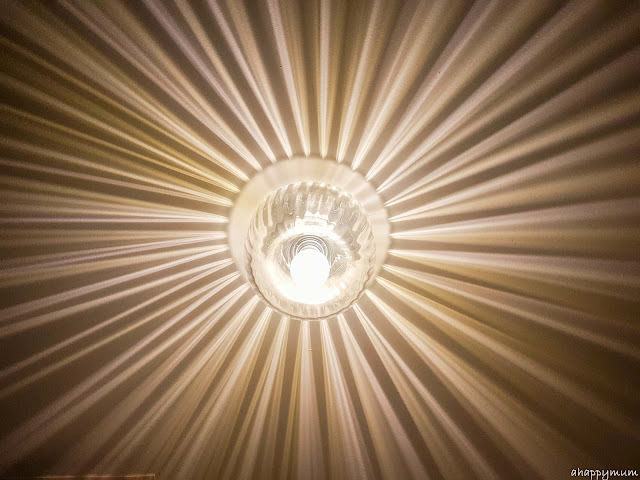 I love this light the moment I saw it in Chan Huat and knew that I had to get it. Suits Summer to a tee, don't you think so? Since our home doesn't come with a storeroom, we had to think of a way to utilise our cupboard space. 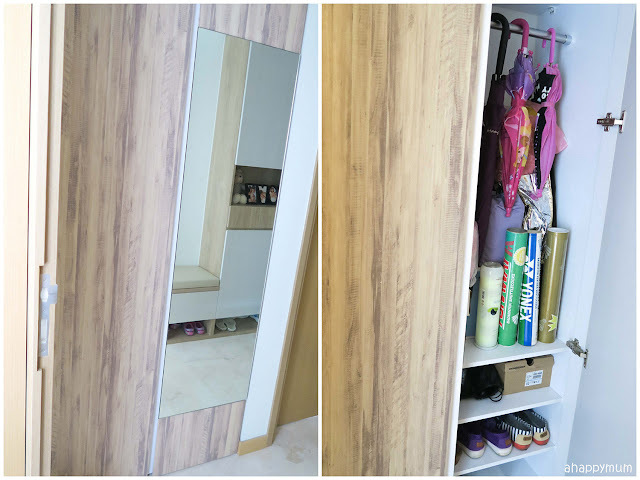 Hence, we decided to revamp the utilities cupboard and with the help of our carpenter, we dismantled the doors, which were originally white, and laminated them to give a wooden, rustic feel and also added a full length mirror on one side. 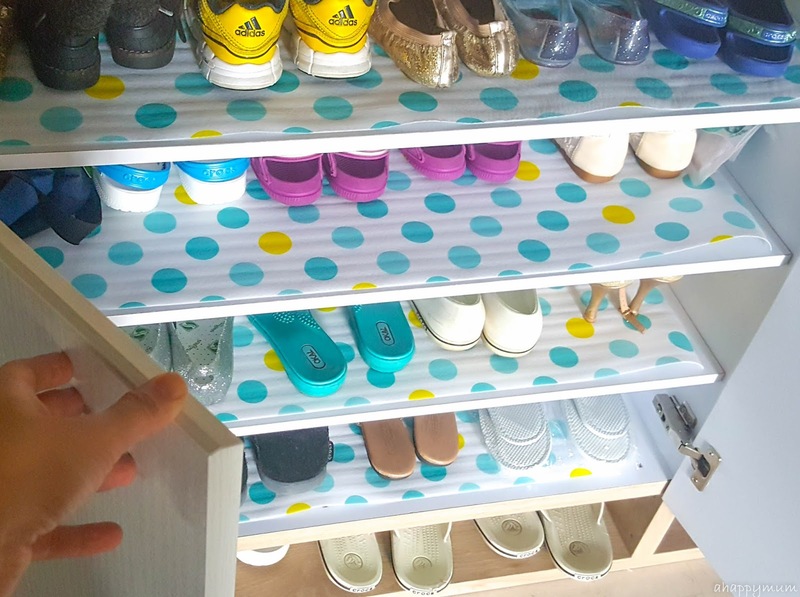 For the inside, we added shelves at the top and bottom so that the in-laws can store their shoes and the hubby can store his sports equipment here and also a rod in the middle for us to have easy access to the umbrellas. 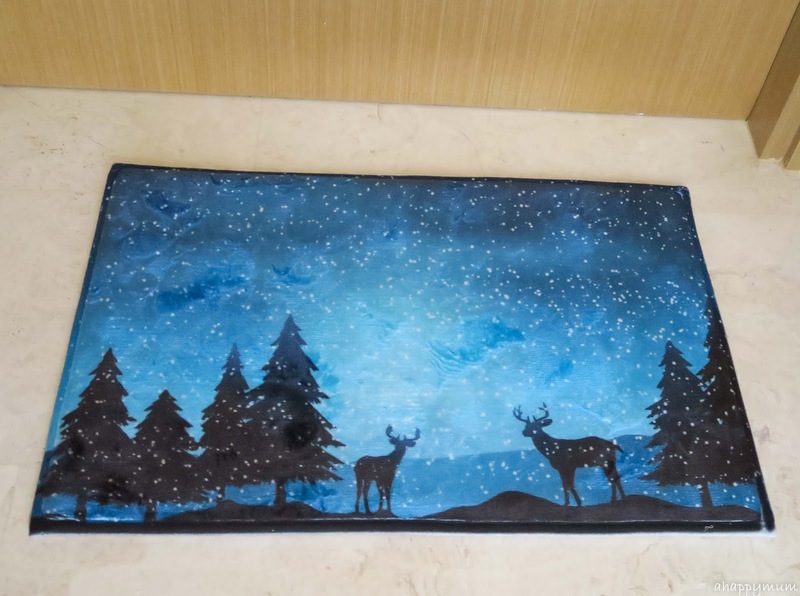 Moving onto our door, I wanted to add a touch of Scandinavian at this point and I found this really scenic, beautiful door mat (this one cost me less than S$6 (exc. shipping) on Taobao) to welcome our guests. I love the wintry feeling and it makes me think about all the wonderful memories we had during those years we lived in Sweden - especially the dog sleigh, the skiing sessions and going in search of the northern lights on a snowmobile across the snow with a toddler in tow. The main highlight for us in the foyer is the shoe cabinet which *cough cough* I designed myself. Yup, in case you don't know yet, we did not engage an interior designer or a contractor for the renovation, so a lot of things had to be done on our own. Though challenging and tiring, it gives us a huge sense of achievement to be able to customise the furniture to our liking. So, for the shoe cabinet, everything from the shape, design, height, shelving, choice of laminates were decided by ourselves. While I don't know how to make use of any design software or app, I do know how to roughly draw and so this was what I provided the carpenter. I also met up with him personally a couple of times to give a precise brief of what we needed for every piece of customised furniture - which you'll come across a few as we tour around the house. Ta-dah! And this was how it turned out in the end. It was the hubby's idea to leave an open shelf at the bottom so that we can easily keep the shoes that we wear on a near daily basis. It was my idea to have a cushioned seat because I knew this would be useful for the in-laws (my kids sit on the floor to wear their shoes and the hubby and I usually just stand or squat), especially my mil who used to have a chair outside our old house just so she could sit down to put on her footwear. See? 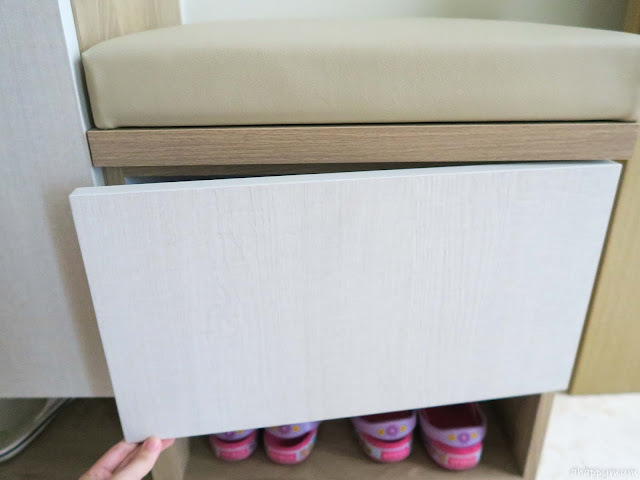 Not only can the girls keep their crocs in the bottom shelf of the seat, it also opens up to a tiny cupboard and Angel keeps her primary school shoes here for easy reach. 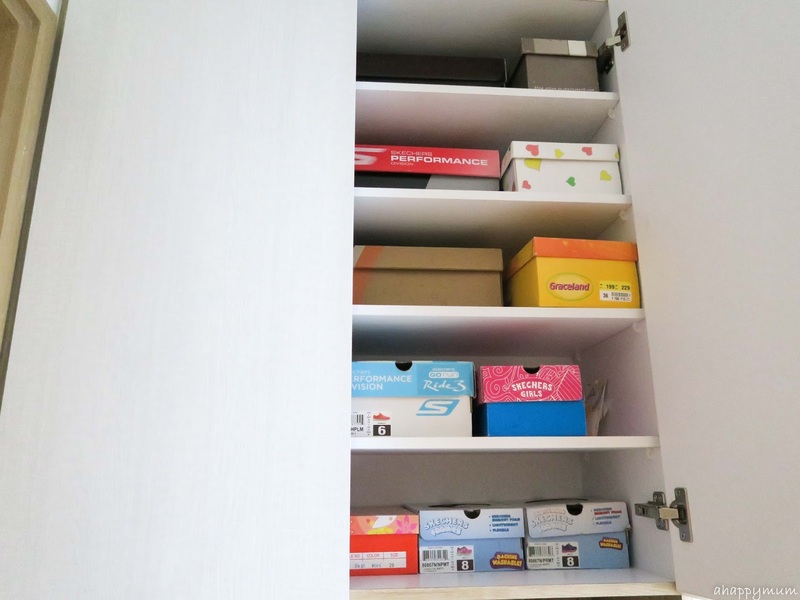 For the top shelves, we keep our shoes which still have boxes and are not frequently worn. The bottom shelves are for the shoes we normally wear and I also added shelf liners so as to keep the cabinet clean. Okay, as you can see, I don't exactly have too many shoes and I probably have less than 10 in total. So, that means the cabinet is more than enough to contain the shoes for all five of us at the moment, at least. 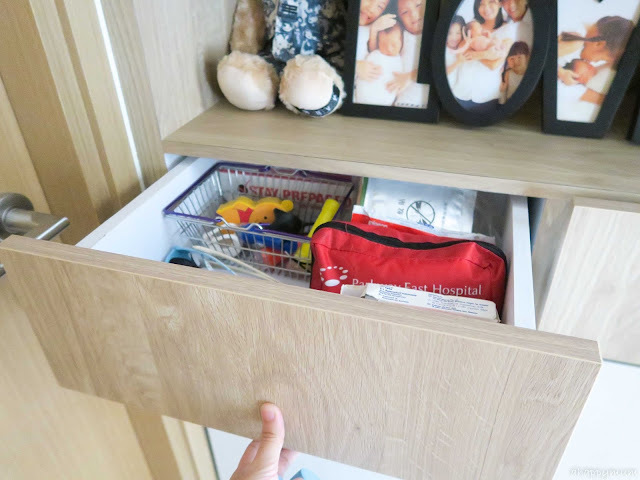 I wanted drawers within the cabinet as they are easy to pull out and come in very handy for storing keys, first aid kits, coins (my hubby always leaves plenty lying around), shades, flashlights, badges and epaulettes for the hubby, cameras etc. I also thought it would be nice to have a display shelf in the middle and in keeping the ornamentation simple, I placed our LOVE photo frame which I brought over from Sweden (which was also the inspiration for our House of Love), two patriotic bears in military uniforms and also the symbolic Eiffel Tower which holds a special meaning for us because that was where our story began when we got engaged. You know what? Halfway through the renovation, we were told that the laminates that we originally chose for our furniture, after much debate and consideration, were from an outdated catalogue and were not in use anymore. So, in rushing to meet production timelines, the hubby and I had to decide on the new and final laminate choices within a day. I kind of think it was fated and the amazing thing is we love how it all eventually turned out and I'm loving the wooden feel of the whole house. 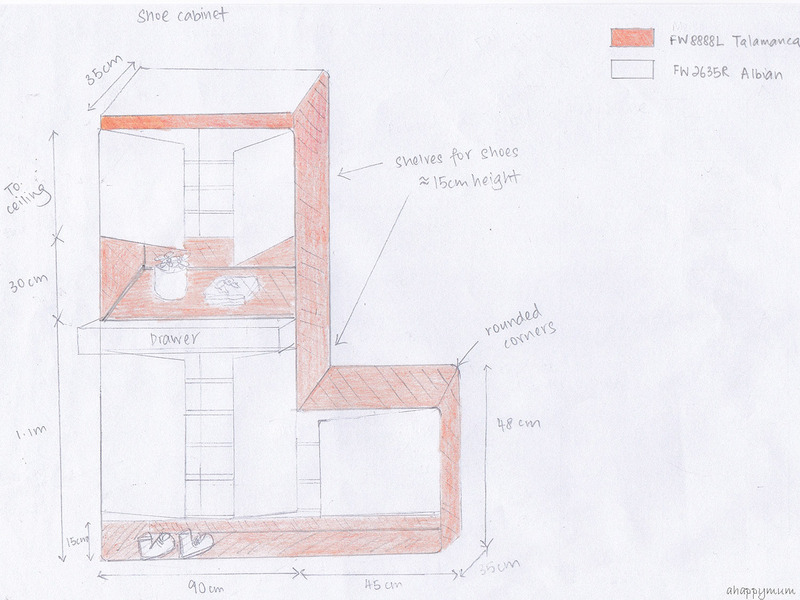 Well, that's all for now and I can't believe I have so much to share for a 5sqm foyer. Can you imagine how it will be once we open the door and how many more stories I have to tell? Till more updates!